A perfect morning for a run! The temperature was a cool 58 degrees - on the edge for running shorts and a tech T-shirt but I was comfortable as I started the run straight from the car. No time to get chilled, and running kept the core temperature up from there. another 5 degrees and I would have switched from shorts to tights. I love this cool weather - the trail is much less crowded and you can't overheat as easily when you are being water-cooled! After last years busy schedule I slacked off running due in part to knee pain. I was seriously looking at hanging up the Brookes and moving over to Clip-ins. This was a big change for me. 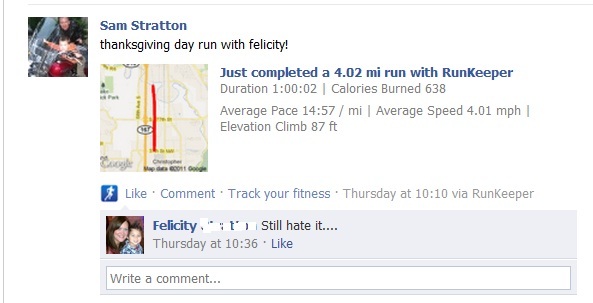 If you've followed the blog for any period of time you know my love for running is immense. I get a lot out of it, mentally, physically and spiritually. I half way resigned myself to running 5Ks every week or so and making due with a half hour of my favorite pastime. Apparently my knees needed rest. The time I let my running slack off allowed for some healing as I have now resumed a moderate level of running. At work we have a program challenging employees to complete two months of exercise. If you perform an average of 30 minutes a day over the course of the program you are rewarded with $100.00 amazon gift certificates - being a "Prime" member this was a great incentive and serves as motivation, but having recently returned to running I am wary that I might overdue. 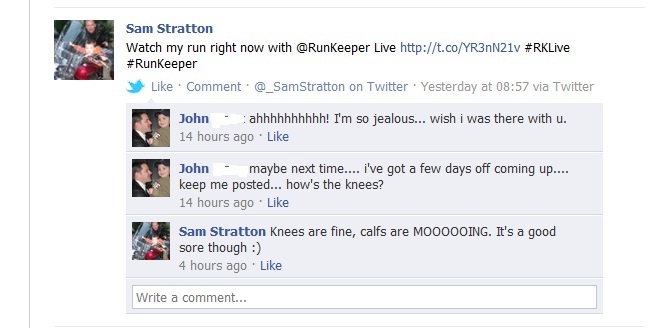 The knee issues seemed to be the result of running downhill without providing them with enough isolation. and as my favorite local route, (right outside my door) has a bunch of hills, I need to be very careful of the stride impact. The downhill stride is much different from running uphill or on level ground, the force of gravity is pulling you to go faster and your stride which on level ground is attempting to sustain your speed now must resisting this pull. The force of impact is now directed opposite of the force you normally exert. Maintaining the same technique you would use for level running will cause large increases in impact force to the knees. Reduce the force by increasing the pace - not the speed. Shortening your stride reduces the overall impact by increasing the amount of steps over a given distance - each step must absorb less of the overall energy. Expanding the impact area is more complex. move the strike further up the foot - mid foot at a minimum, keep your heel off the pavement, running downhill with heel-strike is a recipe for disaster. Lean forward slightly - yes it's counter intuitive you are trying to control speed so you lean back, but leaning back again focuses the impact of your body directly on the knees. If you lean forward slightly more of the impact force is absorbed across the spine and hips dividing the overall impact many times. What your Coach Never Told You about Running! Sometimes as we progress through life we experience issues that can scare the bejeebers out of us. One of these happened while running last week. First off - What a wonderful run! 9:30 pace for a 10K, and No knee pain! I was a happy runner! At least until I went home. Must SEE a DOCTOR! SEE a DOCTOR Right NOW! 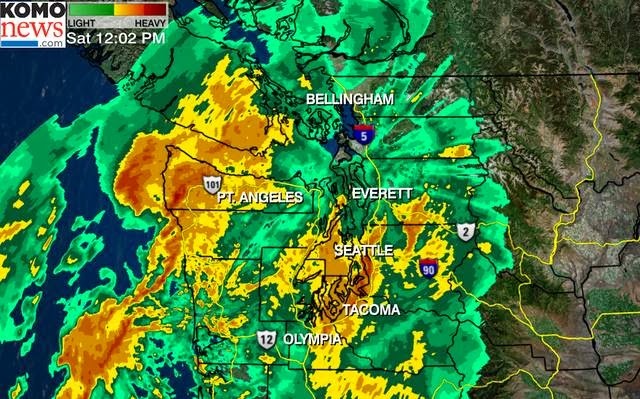 This is all well and good but when I got home I experienced something I had never experienced before and it scared me silly - Blood in the urine! Yes, it is very, VERY disconcerting when the toilet bowl is RED, not a pink, but a bright deep angry red. Did I mention being scared? I waited for my wife to get home and consulted her. She thought my assessment was quite valid and apropos. She went with me to the doc's office. Running on an empty stomach - good. Running on an empty bladder? Not so much! Raise your hand if you go to the bathroom and empty your bladder before running. We all do. Who wants to run when you got to go? It appears that a study was performed by a british Naval surgeon named Blacklock. Cpt Blacklock was wanting to know why some of the cadets were having this malady. Using a cytoscope, he saw that the bladders of the men were all bruised and bleeding. This was caused by running on an empty bladder. the issue does not present itself on a half filled bladder. So how does this help us? I will still empty my bladder before running, or else I won't be able to run as far - We are not talking about 50yd dashes, we are talking miles and miles. I am hoping that this does not happen often - this was the first time for me and hopefully the last. But not to worry If it happens again, I now have the knowledge not to freak out. And if you read this, hopefully you will too! It's been some time since my last post, the preceding time has been filled with wonderful life changes. I have achieved my weight loss goals and have found new passions to engage and bring fulfillment to my life. First off I have found the most wonderful woman in the world who found my ways not too annoying and agreed to marry me. I live for her! Zumba is still a passion of mine, but running still is the place I go for healing, meditative exercise. I find the peace of distance and repetition as wondrous as ever and hope to get back to the "hours" of running before my present knee predicament. 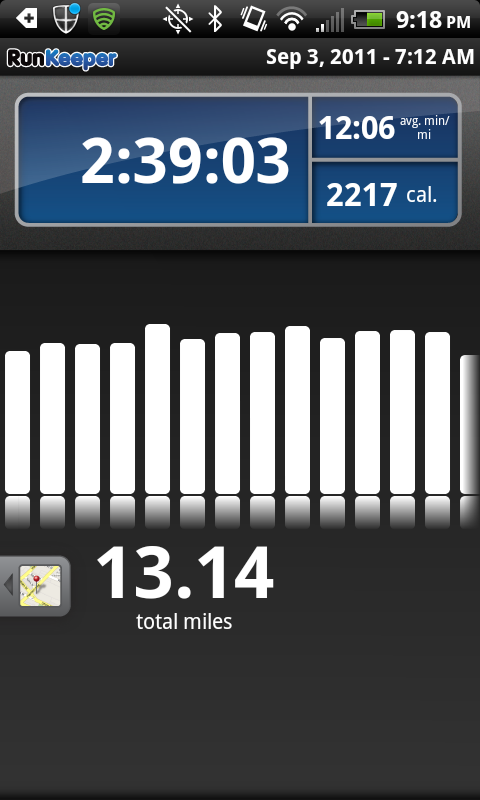 If you've read my blog for more than a couple of post you know I like distance, a good run is an hour or better. After starting biking in the summers and going through my knoee surgery I thought I could just pick up where I left off, running 10Ks as my "meat and potatoes" run. Apparently this is not the most prudent method for returning to active running and my knee informed me in no uncertain terms that I was overdoing it. Sin I was well into Zumba, Biking and my new soul-mate I let running slide to the back burner. 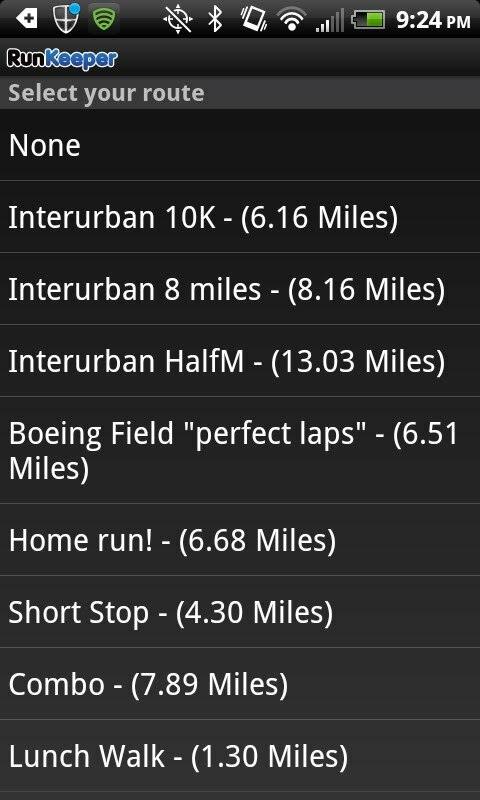 One thing I noticed was that last year when looking at pace/heart rate I was at 11:31/mi @154 now I'm at 10:00/mi @ 155. Another bummer was that my Garmin Forerunner 305's battery had seen it's better days and would only last 15 minutes - I emailed Garmin service after seeing prices for that model were in the $300.00 range ( I bought mine at a Best Buy back in 2009. You can tell that there is demand for a product when the price stays solid for that long. My warranty was long gone, but they offered to exchange it for a flat rate $75.00. I jumped on it and received it back just last week. So now lets see if I can build back up to more "normal" distances. I'm going to try to go slow, but the addictive call of the endorphin is a powerful thing. Anyone with an iPhone or Android based phone can attest to their "swiss army knife-iferousness" they can call, surf, play, snap, and many other one syllable verbs. 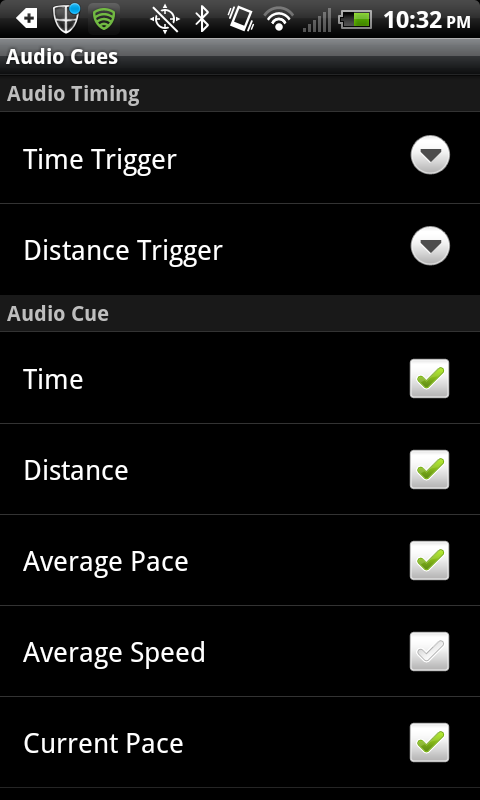 After getting a Sprint HTC Evo last may I found that there is one application no Android ( or iPhone) should be without. 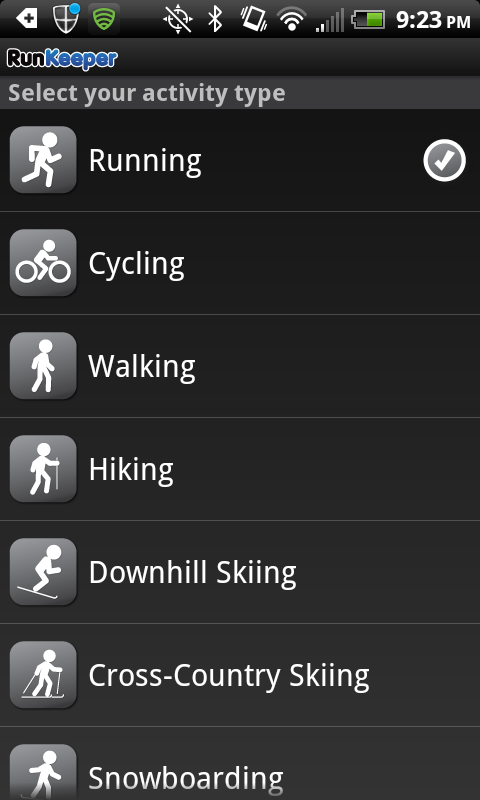 This lil app is called Runkeeper. It sounds simple enough, but the wealth of information the app coaxes out of your smartphone is awesome. Google Maps, Google maps that you can draw on, Google maps that you can draw on that save the drawings and tell you how far you've drawn. Is this cool or what? Everybody has their old comfy routes that they know like the back of their hands, why not document them so you can share them with others? 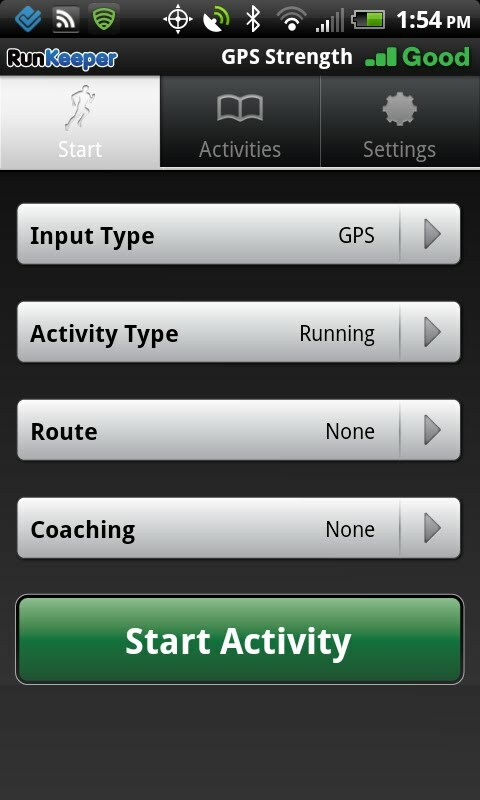 I've found this feature useful now I can tell friends that want to go running with me exactly what they are in for. 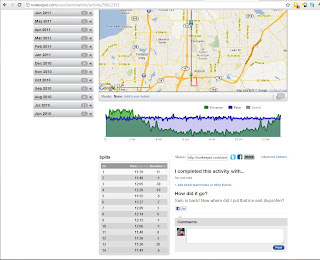 From the webpage, all the information is at your fingertips, a very nice way to show pace and elevation. Breaking out the split times in mile intervals is helpful in building consistency and seeing the effects of adjustments you make during your run. I did not have a heart meter for this review, but I am looking into them - heart rate is a very important stat in training. 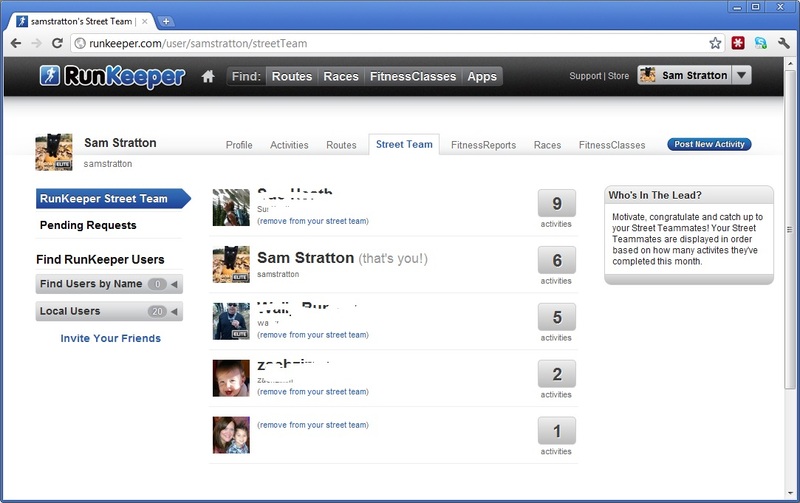 Runkeeper does one thing well - it is an awesome app for measuring fitness progress, but even smarter than that, they leverage the 200 ton gorilla that is Facebook to increase their networks reach and leave the "social" to the experts, but you can also link directly to your friends within a feature called Street Team. 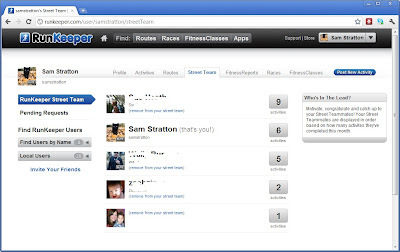 The folks at Runkeeper realize that everyone is social on twitter and facebook - you can choose to let built in connectors post your activities to the social networks. Well, Doesn't That Just Frost You! Knee pain is a quirky, stupid, and aggravating thing! Sometimes the waiting game doesn't pay off, some times it does. This time it turned out to be the waiting game that paid off. I waited until the pain was a memory and started again, first 4 miles, no pain. 6 miles, no pain. Another 6 miles and a little warning pain. ARRRG! Frosted Flakes fortified with Essential Insights! Then came the fateful Sunday morning, I wanted to get a run in before church, it was a foggy, icy, frosty, cold November morning. You could tell the sun had grudgingly rose by the slightly less dark 50 meter circle of world the fog permitted you to see. The thermometer in my truck read 27 but the ashpalt running trail appeared only slightly damp I'd have to test it, but the path did not look to slick. 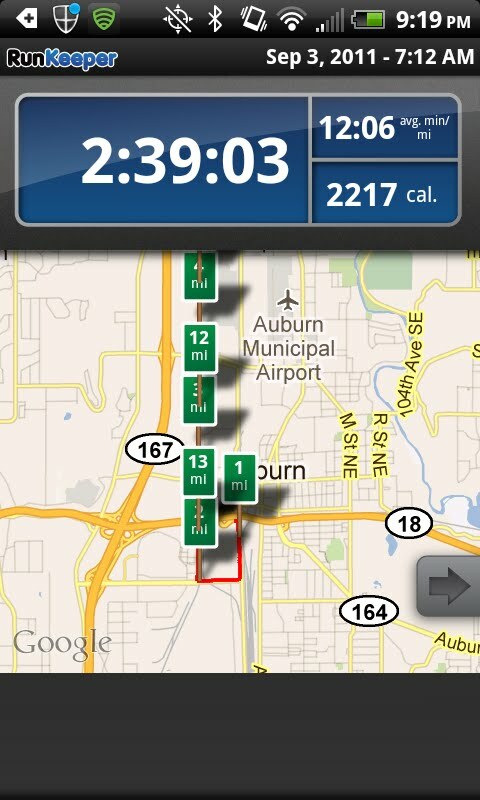 I was running a 5 mile course Auburn to Kent and back. The start of a run in always a time to check out your body - before I get started I usually stretch out Achilles, but since I'm not going too fast I let the beginning of the run serve as warm up. The trail is not slick at all, but I notice white patches of frost in the distance. there is no chance of measurable precipitation, but the occasional flake falls through the fog, condensing in the 500-1000 feet of fog above my head. I hit the white patches of trail carefully, not too slippery. I see other prints in the frost trail off ahead of me. I wasn't the first one out? wow, early runner! At least there's only one set of prints, I feel like less of a slacker. Crossing the train tracks just past 277th I exercise extreme caution, the hardened rubber plates dividing the track are slick! The run feels good, but I'm starting to feel the tell tale twinge in my right knee as I'm crossing the green river bridge - I'm being really careful as the bridge was covered in a thick coasting of frost. The frost is pretty much covering the trail - I take this time to critique the preceding runners tracks - great form, straight steps, but the stride is way long, either he's 8'5" or he's setting himself up for problems, or he's sprinting the whole way. I reach the turn around at Willis and head back. My knee is telling me it's hurting, but not to intensely. as I look back across the path to the now two sets of tracks in the frost. My stride is an easy 8-10 inches shorter, then EUREKA!!!!!! You Run Like a Penguin! My stride may be perfect for maintaining the proper cadence ( 180 steps per minute) but I'm running like a PENGUIN! I just figured out why the inside on my right knee is hurting - GAS PEDAL FOOT! While you are driving, your right heel tends to sit between your brake pedal and the accelerator but the top of your foot rests off at an angle - over time that becomes an accustomed rest position for the foot, and when you are running, if you maintain that position the end of your right stride puts additional pressure on the front inside of your knee joint. The rest of the run I concentrated on the now unnatural feel of straight in line footfalls, it felt wierd, but NO MORE PAIN!